The embroidery machine for people who love to sew. Create monogrammed napkins, embroidered garments, decorative pillows and so much more, all with one machine: the new SINGER® FUTURA™ XL-550 sewing and embroidery machine. The FUTURA XL-550 sewing and embroidery machine makes it easy to let your creativity lead the way! Create monogrammed napkins, embroidered garments, decorative pillows and so much more, all with one machine. 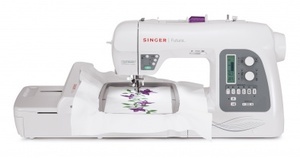 Comes with 215 sewing stitches, 125 built-in embroidery designs and great automatic features. Built-In Multilingual Alphabets: English, French, German, Italian, Dutch, Spanish, Turkish, Norwegian and Russian. handwheel toward you and stopping at the top. turn on the machine without any hoop connected.) This allows the embroidery unit to move.